This article discusses advantages of non-destructive, on the spot alloy analysis. The utility of Hand-held XRF (HH-XRF) analyzers, also known as PMI analyzers or XRF alloy analyzers, is explained in practical terms that apply directly to positive material identification (PMI) inspection. Beyond an overview of the technology and its traditional uses, remarkable recent developments are identified and their impact is related directly to alloy PMI testing. Dramatically improved hardware and software bring a new level speed, a wider elemental range, and an improved accuracy to the field-testing of alloy materials. Specifically, 10x better detector performance, 5 to 50 times better sensitivity for most elements, a new ability to analyze light elements such as Mg, Al, Si, P, and S, high temperature "in-service" testing, and beam collimation for superior weld analysis are among the innovations discussed. For industrial component suppliers or industrial plant operations, PMI inspection and material verification are key concerns. Whether for corrosion resistance, temperature tolerance, or mechanical characteristics, alloys are specified by design. An alloy material mix-up can result in component failure. Component failure costs include down time, repair and replacement, lost (leaking) material, environmental and fire hazards, or batch contamination. Handheld XRF (HH-XRF) is a fast, non-destructive testing (NDT) technique for measuring alloy composition, confirm alloy grades, and perform PMI inspections. Whether producing components, receiving alloy materials, installing pipes, valves, or other mission critical items, or just a simple confirmation check of in-service process systems, HH-XRF provides rapid, definitive material confirmation. PMI Analyzer operators can quickly ID material mix-ups, improve material control processes, and enjoy a rapid return on investment. Most alloy compositions fall within the range of detectable elements for HH-XRF (Figure 1). 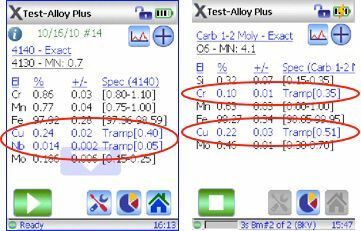 Alloy samples, because of their homogeneity and predominance of highly responsive elements, are ideal for XRF analysis. Processing this spectral signature into sample chemistry and grade ID - step 5. As XRF is a near surface measurement (~10 microns deep for alloy samples), painted, plated, corroded, or peened surfaces may require preparation/grinding. Currently, only elements heavier than Sodium (Na) may be tested with HH-XRF. No direct measurement of Carbon, Beryllium, Boron, or Lithium is currently possible. But, even with these limitations, XRF provides quick (two seconds for most alloys), typically non-destructive, in-situ testing. The rugged industrial packaging is designed for indoor, outdoor, and high temperature applications. While not a 100% metallurgical certification, Handheld PMI analyzers can typically measure 99.5+% of most industrial alloys. To verify a grade, it is only necessary to distinguish it from other similar grades. Typically, this is easily done. Grades that are 99% identical such as SS-303, SS-304, SS-321, and SS-347, or 9 Chrome and 9 Chrome + V are easily sorted by grade specific differences visible to HH-XRF. These differences can be as small as 0.05%. Unlike lab analysis, where the user pays as they go (in time and money) for each and every test, with HH-XRF, almost all of the cost is the upfront capital cost. 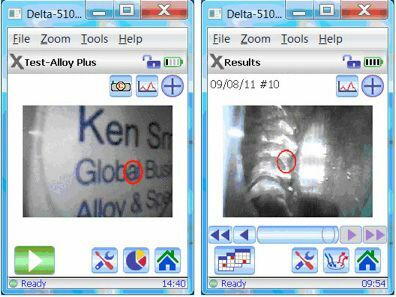 Once the XRF PMI analyzer is purchased, each test is a two-second "point and shoot" event. As the additional cost per test is trivial, this invites redundant testing. PMI inspection is performed at receiving to verify incoming materials at the door. Test again at the time of use or installation to catch any post receiving material handling error. A welding rod, whether stocked in the wrong bin or taken from the wrong bin, can be verified correct or rejected in the matter of two seconds. And, test again either on the installed component in-service or at final QC before shipping. A single test at receiving won't catch downstream errors in fabrication or installation. The goal of material testing is not only to confirm that the material is correct, but also to correct the errant processes that cause mix-ups. Redundant testing with a PMI analyzer is the fastest and easiest way to find and eliminate material mix-ups. Starting in the 1980s, field portable XRF was best suited for testing stainless steels, chrome-molybdenum steels, nickel alloys, and cobalt alloys. Low Alloy Steels, Copper and Titanium Grades have been handled in a more limited manner because identification of many of these grades requires or benefits from the ability to directly measure light elements such as Aluminum, Silicon, Sulfur, and Phosphorous. Aluminum grades were tested only in a very limited basis. The direct measurement of Magnesium, Aluminum, and Silicon at levels below 0.5% is essential to meaningful testing of Aluminum. Table 1 (below) places typical Limits of Detection (LODs) for key XRF alloy testing elements on a "technology/time line." Lowers the electrical noise improving the signal to noise ratio - contributing to lower detection limits listed above. With detection limits often below 100 ppm, common tramp elements such as Titanium, Vanadium, Cobalt, Copper, Tungsten, Niobium, and Tin can be measured and identified as tramp material, allowing excellent grade matching, library grade integrity, and clear identification of common tramp elements and their concentrations. Nominal Value Inclusion (Figure 4) uses grade specifications to incorporate expected values of elements not visible to XRF PMI analyzers. Essentially, this is a practical way to add useful information on light elements to a short, simple test. Beyond giving the operator a heads up that the sample is expected to contain Aluminum or Silicon or Boron or Beryllium when it cannot be or was not measured, the balance material value is corrected as well. Thus, where a confident grade match is made, nominal value inclusion provides useful information and typically better chemistry. In the screen shots above, the results shown on the left displays a two-second test with nominal value inclusion shows the nominal (expected value) of aluminum. The 20-second test in the center shows a measured value for aluminum. In these two cases, the user gets virtually identical and accurate information. In the 3rd case, a two-second shot without the benefit of "nominal value inclusion" identifies the same grade, but lists no aluminum value and shows the Titanium to be 5% higher than the actual value. In fact, the reported precision for Titanium is better than 1%, but the accuracy, because of the missing aluminum, is off by 5 percent! Grade Match Messaging gives a quick, customizable message specific to the grade matched by the analyzer. Grade Match Messaging is useful for alloys with more than one common name, for guiding users regarding the handling of the material, or for giving other complementary information about the material. SmartSort allows the PMI analyzer to automatically decide when to perform extended testing for light elements. This is a time saving feature that allows the user to use shorter tests most of the time but to automatically extend the testing when direct measurement of light elements is necessary for accurate grade ID. Heavy-duty testing cycles (running many tests and long tests-60 seconds or more-with only a few seconds between each test). These challenges can occur separately or in combination. A recent innovation is an improved design for wicking away heat from the instrument (Figure 5). The top portion of the analyzer acts as a radiator or a heat sink. The ridged aluminum surface on the top of the PMI analyzer is directly tied in to the primary sources of heat within the instrument. The result is an efficient, preferential channel that directs heat away from the analyzer. Previously, only the metal probe head provided this function. This new design extends the analyzer's ability to handle the stress of hot, in-service PMI testing. Testing using only the primary or "traditional" energy beam. Using only the "yellow" Kapton window (Figure 6). This second light element eam adds 10 to 60 seconds to the test length, which is much too long for hot, in-service samples. For temperatures above 600 F or 315 C, using a tipping technique to minimize heat transfer. The tilting technique is illustrated below (Figure 7). The data below (Table 2) compares the "tipping technique" (2nd photo, Figure 7.) to the use of a thin, protective, ceramic heat shield (3rd photo in Figure 7). The PMI analyzer's detector is cooled by a Peltier cooler to -35° C. When testing hot samples, the voltage required to drive the Peltier to cool the detector increases. This table indicates "how hard" the PMI analyzer must work to maintain the proper detector temperature. The tilting technique, maybe non-intuitively, works better on hot samples than an insulating heat mask. While the heat mask remains an option because it is better for temperatures above 600 F than the traditional flush technique (3rd photo, Figure 7), the tilting technique works well within operating range all the way up to 900 F samples. Because alloyed metal is a favorable material (homogeneous and rich with strong, responsive elements) for HH-XRF testing, PMI analysis of irregular shapes or very small pieces can be easily accomplished. However, when 2 dissimilar metals are abutted or co-joined, as can be the case with weld testing, the key is to narrow the x-ray beam, and then to be able to aim this narrow beam, so that the test can be specific to only one of the metals. An internal, 8 position filter wheel, positioned between the X-ray tube and the sample window is used to condition the X-ray beam. A simple user interface allows the user to select a beam spot collimated to 3mm in diameter. Beyond that, a built in camera allows the precise aiming required to focus exclusively on the smaller analysis target. Below are two screen shots showing the camera view and the red aiming circle for locating the beam spot. The first view is simply a business card to give an idea of the scale. The second shows a beam spot located to measure the right edge of a fillet weld. This weld measures 7 mm across - thus it would be practical to measure a center, a left, and a right edge for concentration differences. In this case, two carbon steel plates welded together with a stainless steel weld material. This was done for XRF demonstration purposes only - not bridge building! In this case, the nickel concentration on the left and right edge is 5.2% and 5.8%, respectively. The center is 7.2% nickel. These are the kinds of differences one would expect moving from the edge of the weld to the center. The smaller beam spot allows for less time spent grinding. Positive Material Identification (PMI) testing with HH-XRF generates a direct return on investment in many ways. For example, testing with a PMI analyzer at receiving eliminates the cost of lost labor and rejected assemblies. PMI inspection at installation or fabrication again prevents lost labor and wasted material costs. And PMI testing when installation or fabrication is complete (final QC) prevents mix-ups and losses related to component failure or product rejection. Better test weld chemistry using beam collimation. With a wider range of "testable" materials, shorter test times (more testing productivity), simpler operation (more people can do the testing), high volume, redundant testing becomes a more cost effective strategy. More material mix-ups can be prevented and corrected at a far lower cost per test. In the end, whether it is process up-time or customer satisfaction, no organization wants to be part of a material mix-up. Rapid, redundant HH-XRF PMI testing provides a practical, cost effective solution. Vanta handheld XRF analyzers are some of the toughest devices Olympus has ever made. These rugged, powerful, and intuitive instruments provide rapid, accurate element analysis and alloy identifications to customers who demand laboratory-quality results in the field.